Have you ever wondered what Disney blogger jobs would be like where all you do is talk about upcoming Disney attractions and events or other media stories that are relevant to the Disney motto and beliefs? Think about all the possibilities that you can write about when it comes to talking about Disney! From theme parks to cruises, to movies and fun activities, there is never a shortage of topics for Disney blogger jobs. If writing is your cup of tea, why not consider using that writing to help promote all things Disney? There are so many great things that one can see and write about that blogging for and about Disney sounds like a dream job come true! If you love Disney but are not a writer at heart then check out other ideas on how to work for Disney from home. 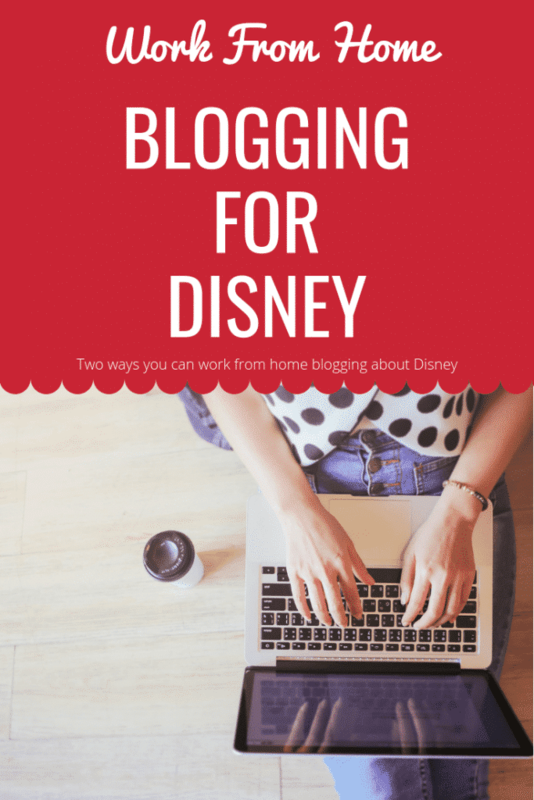 Did you know that there are a couple of different Disney blogger jobs that you can do from home? Here are just two options to consider! Disney owns Babble.com and has people writing for them all the time. If you have a great article idea, consider reaching out to them and seeing if they will feature your article. Babble has a ton of different topics that they have on their site so it’s always a good idea to do your research and see what types of articles that they typically look for. Their articles range from parenting advice to vacation ideas, to anything that might be trending in the world. Getting your foot in the door is a great way to start writing for a Disney company. The pay per article is around $150 for a 1200 word article supposedly. If you have an idea for an article do a search on the Babble to see if your topic has been covered already. If not, indicate in the subject line of your email what section of Babble your piece would run: pregnancy, baby, toddler, kid, mom, celebrity,products, or food. Also include your article topic in the subject line as well. Indicate in the email if you’ve written for Babble before (include links to articles) and include 2-3 links to other things you’ve written. State the topic of your piece in 1-2 lines maximum. Also explain your angle — your new contribution to the topic, what’s insightful/entertaining/counter-intuitive/poignant about your approach. For this, again, 1-2 lines maximum. Provide the first paragraph of the piece and then an outline of the rest. If it’s a list, include a few sample entries. If the piece is already written, include it as an attachment. They are unable to accept articles that have been published elsewhere, including on personal blogs. Only submit a piece once and please don’t follow up. Because of the volume of submissions, they can’t respond to everyone. Please direct all submissions to submissions@babble.com. Did you know that you can create your own Disney blog to start writing about Disney? It’s 100% true, and a simple process to start. All you have to do is think of a domain and site name, and then get your site set up. Once you have the foundation set, you can literally start writing about anything Disney that you want to! You can find out more about how to start a blog with my Quickstart Guide to Becoming a Blogger. There are so many great Disney blogs out there that do a wonderful job at representing all the positive things that Disney has to offer. Dig deep and figure out what about Disney that you love so much. Then, once you find that thought process that makes you smile, why not start your own Disney blog about it? You can talk about theme parks, Disney vacation ideas, family trips to Disney, new Disney movies that are going to come out…the sky is truly the limit. And truth be told, if you decide to run and write your very own Disney blog, you can talk about all those things and so much more! With everything that Disney runs and operates in the world, it isn’t a stretch of the imagination to say that finding Disney blogging jobs should be fairly simple. Although, even though there may be a lot of open jobs out there to write about Disney, keep in mind that the competition could be quite fierce. In times that you are competing with hundreds, and possibly even thousands of other applicants to submit an article, it’s time to give serious consideration to starting your very own Disney blog. Channel your love for Disney, and you’ll have no issues thinking up great content that you can write about with ease. Wondering how you make money with a Disney blog? Just like any other blog it takes time to establish your blog, build a following, and start making money. You will want to focus on writing quality content and then sharing that content through social media and email. Pinterest is a great way for new bloggers to get traffic until you can establish an email list and start building organic search traffic. Once you start getting some traffic you will want to look into the different ways to make income with your blog which are ad income, top paying affiliate programs, sponsored posts, and making and selling your own products. See our Ultimate List of Blogging Resources for more information. Once you have an established Disney blogger job you can start working on your connection with Disney by following their social media accounts, get added to their PR list, and send them a media kit. You may then start getting invited to their media days or even the coveted Disney Social Media Moms Conference. One other great aspect about Disney blogger jobs is that with everything going on all year long that is Disney related, you’ll never run out of great Disney content to promote and write about!